Laurence R. Jurdem who received his Ph.D. from Fordham University in U.S. History is an independent scholar living in San Francisco, California. His book "In Defense of America: Conservative Media, the Rise of Reagan and the Revitalization of the Cold War 1964-1980" is in the process of being prepared for publication. Over the course of the 2016 presidential campaign much has been made of the comparisons between the apparent GOP nominee Donald Trump and his 1964 Republican predecessor Senator Barry Goldwater. Commentators have made the argument that Mr. Trump’s xenophobic comments about Muslims and Latinos will doom his populist campaign, just as Goldwater’s remarks about using nuclear weapons against the North Vietnamese ended his own presidential hopes. However, what has not been discussed are the similarities between the woman who hopes to derail Mr. Trump’s presidential aspirations and the man who defeated the Arizona senator in one of the greatest political landslides in American history. While Hilary Clinton and president Lyndon B. Johnson’s careers were very different, there are striking commonalities between the 36th president and the former secretary of state who seeks to become the 45th person to occupy the Oval Office. Despite the difference in the trajectory of their journeys, President Johnson and Secretary Clinton have displayed similar character traits that have both helped and hindered them over the course of their time in public life. The two are tied together in a number of ways. Both Johnson and Clinton remain longtime members of the Democratic establishment who spent more than two decades in the nation’s capital before choosing to run for president. While both spent their time in Washington in different areas of the political arena, Johnson in Congress and Clinton as First Lady, senator from New York and secretary of state, each was able to use these positions as an apprenticeship to gain an understanding of not only the policy making process, but how to manipulate the levers of political power. Both were a quick study and rapidly came to realize the importance not only of understanding public issues, but the necessity of constructing political relationships that were critical in the accomplishment of a specific agenda. While Johnson in his capacity as majority leader of the U.S. Senate and Clinton in her various policy roles during her husband’s administration, were both perceived as often overly aggressive or heavy handed, each was also respected for their determination to accomplish goals and having a penchant for hard work. Despite each running unsuccessfully for president, Johnson and Clinton were selected by Presidents Kennedy and Obama to be part of their respective administrations. The decision to include their former rivals was done partially because each knew they needed to add someone who was not only an experienced Washington hand, but to create a sense of unity within the Democratic Party after two highly contentious primaries in 1960 and 2008. While LBJ and Mrs. Clinton each brought a tremendous amount of experience to their respective positions as vice president and secretary of state, neither one possessed the charisma and eloquence to match the presidents they served. While Johnson had a greater understanding and talent for the legislative process than JFK, the public never embraced the politician from the Texas hill country as they had his Eastern educated predecessor. The same can be said about Secretary Clinton. While she had more experience in the ways of Washington than President Obama did upon his election, her continuing duel with Senator Bernie Sanders illustrates that Democrats do not find her oratory or campaign style as appealing as that of her former boss. While the challenge of attaining a greater sense of likeability with the voters has been one hurdle that both candidates had to overcome, Clinton and Johnson have been and were consistently pursued by numerous ethical questions that over time caused much of the public to wonder if either possessed the integrity the office of the presidency requires. Throughout his time in public life, Johnson was accused of a variety of illegal activities. These included stealing the 1948 Democratic primary that allowed him to win his senate seat, to using the power of his various offices to enrich himself, thus allowing him to become one of the wealthiest men in Washington. While these accusations were never proven during his lifetime, the aura of mistrust and the suspicion that he made decisions based purely on political expediency undermined his appeal. Almost from the moment she began her duties as First Lady in 1993, she and President Clinton were beset by numerous claims that not only included financial malfeasance and public corruption, but the (false) belief that she had orchestrated the murder of a trusted colleague. Many still believe that while serving as secretary of state she was responsible for the death of America’s ambassador to Libya along with a number of his associates. As with LBJ, while the public believes Secretary Clinton is competent, many view her as one who is not capable of being authentic or telling the truth in either her public or private life. There is no doubt that Mrs. Clinton is viewed with suspicion in the same way today that President Johnson was perceived during his own time. 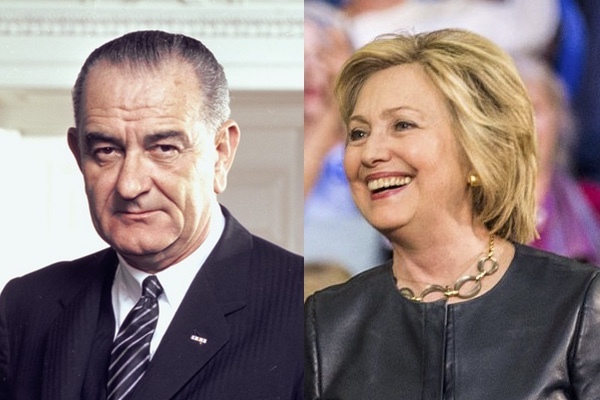 However, the one quality that both Mrs. Clinton and LBJ possess that sets them apart from other members of the political class, is a tenacity and strength of will that have allowed each of them to not only survive but thrive in an occupation where one misstep can lead to professional oblivion. Despite adversity, Lyndon Johnson was able to harness his drive and ambition to triumph over naysayers who had mocked him as “Landslide Lyndon.” If Mrs. Clinton can learn the lessons of LBJ she may yet get the opportunity to dance at her inaugural ball next year.